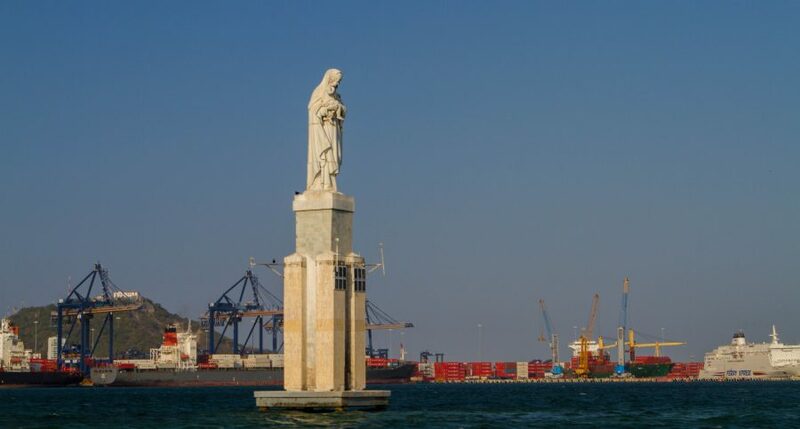 During our visit to Colombia, we situated ourselves in the beautiful north coastal town of Cartagena. We explored the fascinating old town and got incredibly lost! To break from the mainland life and unwind for a time we decided to go on a day trip to the nearby Pirate Island which is part of the Rosario Islands. We had heard from locals and visitors alike that the beaches on the islands were more beautiful than the beaches in Cartagena, and with all our running around, we could use the chance to unwind. The Rosario Islands are part of a Natural National Park in Colombia that was established in 1977. The park is one of 46 natural national parks in Colombia and is composed of over 30 islands. The amazing coral reefs, sea flora and fauna, mangroves and lagoons are home to more than 1,300 species of plants and animals. 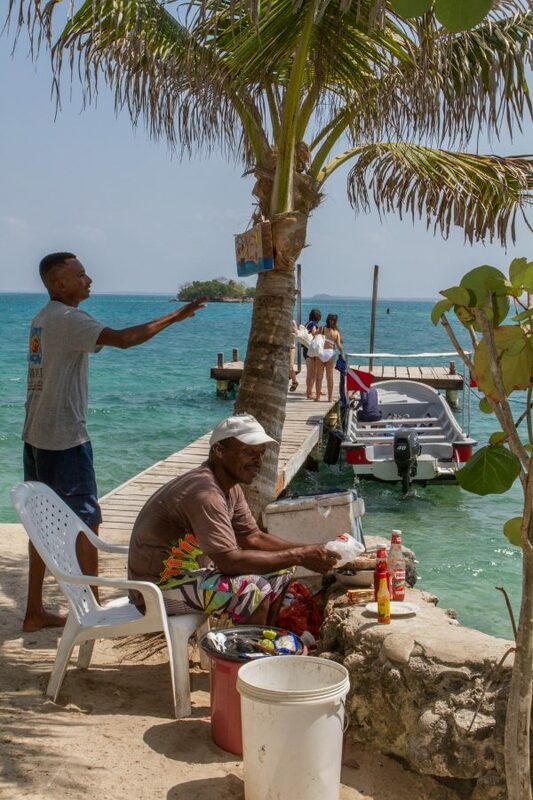 Most visitors to the park are drawn to the three most common islands, Isla Rosario, Isla Grande, and Isla del Pirata. 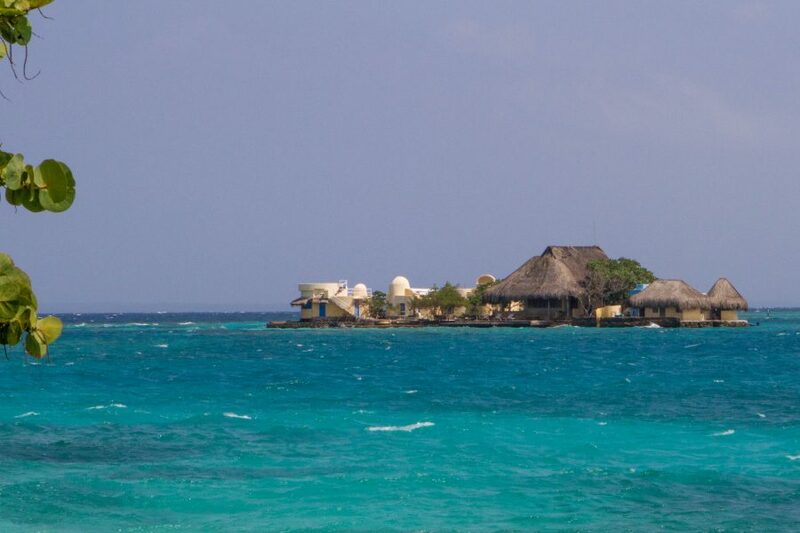 Isla Rosario is the most commonly visited of the islands as it houses the Oceanario Aquarium. The aquarium is small and geared towards education rather than entertainment. There is also a small dolphin show. Most tours add Isla Rosario as an optional add-on rather than being the main island of the tour. Another popular island to visit is Isla Grande, the largest of the Rosario Islands. Because of the island’s size, it actually has a few full-time, local residents. The island also has a private bird sanctuary that doesn’t charge an entrance fee. Interestingly, we didn’t find a day tour that offered this as a stop during our visit. Isla del Pirata or Pirate Island is less than a mile long, it houses a hotel and tourists can stay overnight if they make prior arrangments. The main activity for tourists on the island is sun lounging or swimming in the bright blue waters. Needless to say, with a name like this and relaxation at its core, our boys made it very clear where they wanted to go! The primary way tourists get to Pirate Island is by joining a tour group. We signed up for the tour right at the tour desk of our hotel, Las Americas Casa de Playa. When we got to the docks, however, it was obvious that booking through the hotel wasn’t necessary. There were several tour outfitters with offices right at the dock. And the sidewalk outside was littered with agents selling tours and tickets. With all the options, it is definitely possible to walk up and book a tour for the same day. The prices varied so it’s a good idea to compare the different tours before booking. We were meeting the rest of our tour group at the La Bodeguita pier in the Historic Center of Cartagena one hour before launch time. The tour didn’t include transportation to the meeting point so we took a taxi from the hotel. It was unclear when we arrived which of the covered waiting areas was for which tour operator, so we asked around and were pointed to one, which we nervously waited under as launch time approached. The canopy had chairs for us to sit on and there were several vendors that sold water and fresh fruit on the pier. We started getting anxious after waiting for 30 minutes as there were a lot of boats loading people up but our tour leader was nowhere to be found. To pass the time the kids escaped the protection of the canopy and explored by walking up and down the pier. C searched the docks in vain for pirates who might know the location of our missing boat. Soon, between the four of us, we had consumed over 1 liter of water as we walked under the hot sun! Thankfully the vendors were selling bottled water at a reasonable price. We retreated to the safety of the canopy to reapply the sunscreen which had washed off from the sweat. At this point, C and D were worried that our boat might have been attached by pirates! But all as was well, as it turns out, we didn’t need to be at the pier until a few minutes before the scheduled departure time of 9 am. Right on cue, a few minutes before 9 am our tour leader for the day showed up with the attendance list. After checking that everyone had the correct voucher, we loaded the boat at about a quarter past nine. Pro-Tip: Lather on a liberal amount of sunscreen. The boat does not provide any shade and the water reflects a lot of the sun’s rays. There were no places to purchase sunscreen at the dock so you’ll need to bring your own bottle for the trip. The boat ride to Pirate Island didn’t start out well for D. All passengers had to put on a life vest and with the heat, it was a struggle to get him to put it on. Plus, it was nap time and he is someone who prefers a little solitude to relax. He just could not get comfortable enough in Kevin’s arms to fall asleep. It was a double whammy as we didn’t think to bring his nap blanket which would have also helped keep the sun away from his face. He cried for what seemed like hours (in reality about 10 minutes) and the entire time we were receiving a multitude of well-meaning but not so helpful advice. 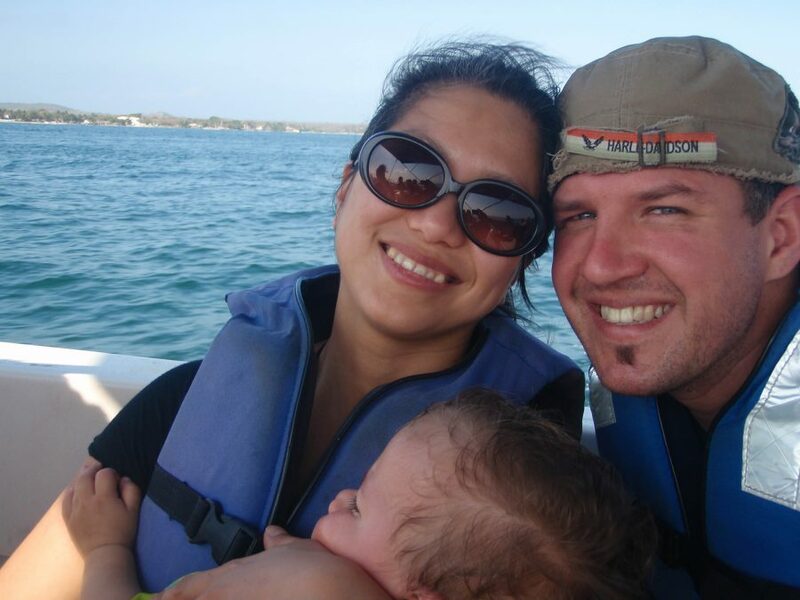 We were so relieved when the continuous rocking of the boat and the cool breeze from the open ocean finally put him to sleep. As I am sure all the other passengers were as well! The trip out of the pier provided a great view of Cartagena harbor. After that, however, there wasn’t much else to see except open ocean as the boat sped on to our destination. After nearly an hour, we reached Pirate Island. Pro-Tip: We brought the both C and D’s life vests from home as we were not sure if they would have properly fitting life vests for kids. This didn’t turn out to be necessary as the boat tour we were on had life vests for kids. As soon as we set foot on Pirate Island we were greeted by fisherman asking if we wanted to upgrade our fish lunches (included in the tour price) to freshly caught lobsters. The children were quite antsy to start digging for hidden pirate treasures and we didn’t feel we had time to haggle so we politely declined. We then proceeded to the sandy area and wasted no time claiming a couple of beach chairs and got ready for the treasure hunt. Pirate Island does not have a traditional beach. instead, they have a small, sandy area with a rock staircase leading down to the ocean. When no treasure materialized on the beach, the kids decided that perhaps they should have been looking for a sunken treasure! 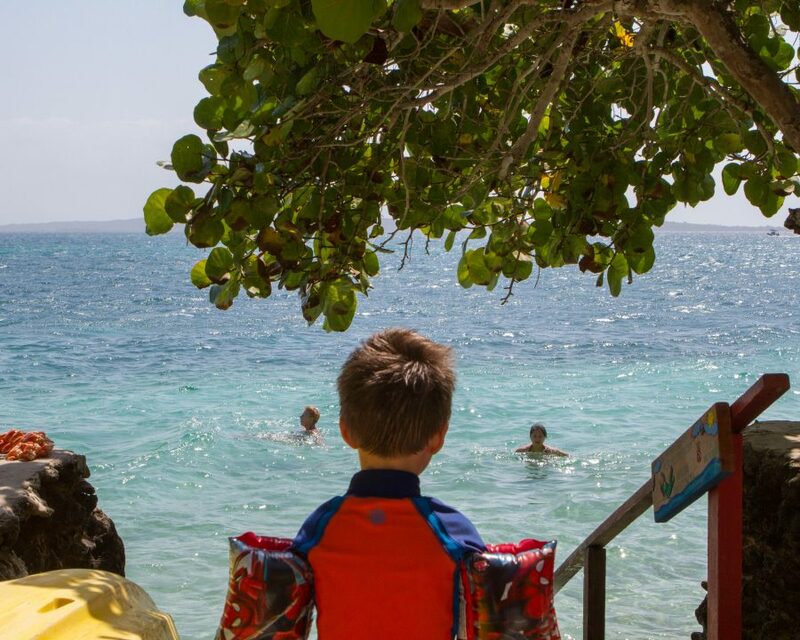 Soon, we were jumping in the warm, blue waters of the Carribean Sea. Pro-Tip: The stairs leading down from the lounge area are incredibly slippery. water shoes would be a helpful thing to bring along. Snorkel gear and canoes can be rented on the island. While we were swimming the hotel staff were busy preparing our lunch. We enjoyed a typical dish of fresh fried fish accompanied with coconut rice, plantains, and fresh salad. After lunch, there was an option to take a boat ride out to Isla Rosario. However, we did some research on the Aquarium and found out that it received a lot of mixed reviews. As we are not fans of dolphin shows, we decided to skip visiting the island and lounge the day away like pirates at rest. The same boat also took a group of snorkelers closer to the reef for much better snorkeling. C and D had given up on the idea of finding the lost treasure and resorted to simply enjoying the amenities of Pirate Island. We spent the rest of the afternoon playing soccer, lounging, and swimming. I also indulged (twice) in some freshly caught and prepared shrimp as a late afternoon snack. Our afternoon was only interrupted once by a jewelry salesman. We had previously read that there is a constant stream of people trying to sell jewelry on the island so we were mildly surprised that we only saw one person. Pleasantly, he only asked once and when we said no didn’t bother us the rest of the time. Pro-Tip: If you decide to upgrade your lunch to a lobster, ensure that you have agreed on a price beforehand. We read of some instances where prices for the lobster seemed to go up after it had been cooked! Fortunately, this did not happen to anybody in our tour group. Before we knew it it was 4pm and our time on the island had come to an end. 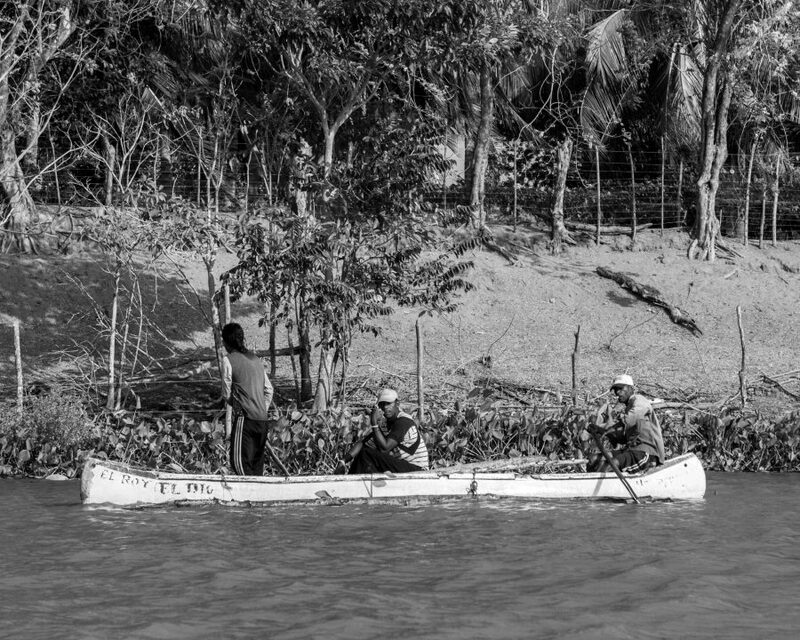 On the way back to Cartagena we traveled via a more scenic route through the mangroves and went at a slower pace to get a closer glimpse of the coastal communities. When we were planning our trip to Colombia, I was largely disappointed by the look of the beaches in Cartagena. However, the Rosario Island boasted postcard-perfect beaches. It was the perfect day tour! Colombia truly is a paradise, offering a myriad of options for travelers. 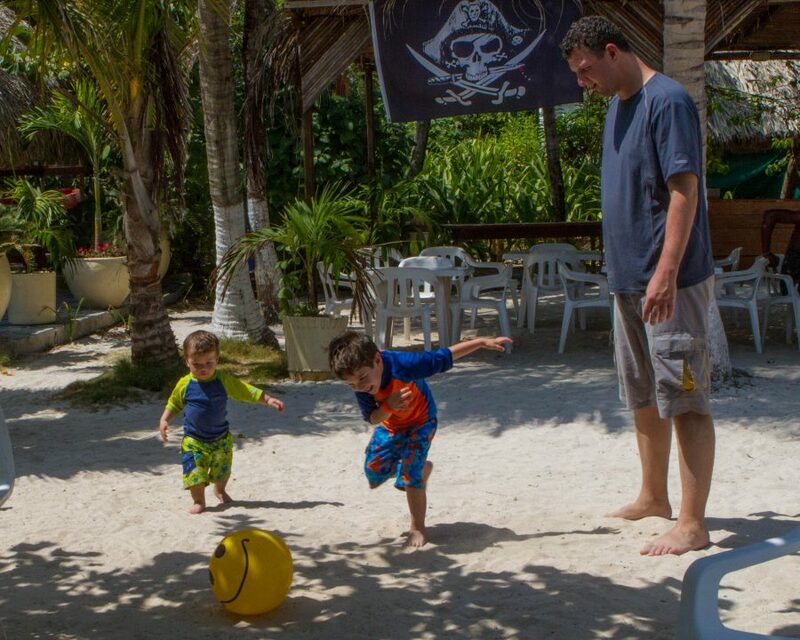 Our kids are always partial to secret beaches and private islands. Have you been to the Rosario Islands? Let us know your favorite places to unwind! What a beautiful spot! I’d love to visit Colombia, but for your post, I’d definitely skip the Pirate Island as too touristic. You managed to describe it in such a way it’s worth a day anyway, thank you! Thanks Marta! Yes, Pirate Island is definitely on the tourist trail. There are so many places in Colombia that more off the beaten the path that we hope to explore someday when we go back. Never minds the kids enjoying Pirate Island, I’d love it here and that’s just because of the name! Looks like a great place to visit! The island looks amazing. It sounds a lot like my experience going to Talu island in Thailand. We weren’t allowed to go on it unless we booked it through a tour or staying at the resort. It’s good because it keeps the natural life there safe and undisturbed by 1000s of visitors. As always, looks like the kids had a great time! Well first of all, thanks for introducing me to another place we will visit when we go to Colombia next winter! Second, I think it’s so inspiring to see families travel together. We are getting married this fall and eventually we will want to have kids, but we also want to travel. Seeing more and more families and bloggers making this happen is really inspiring and motivational. I am so glad I have been introduced to your blog! You guys are amazing! Thanks for sharing. 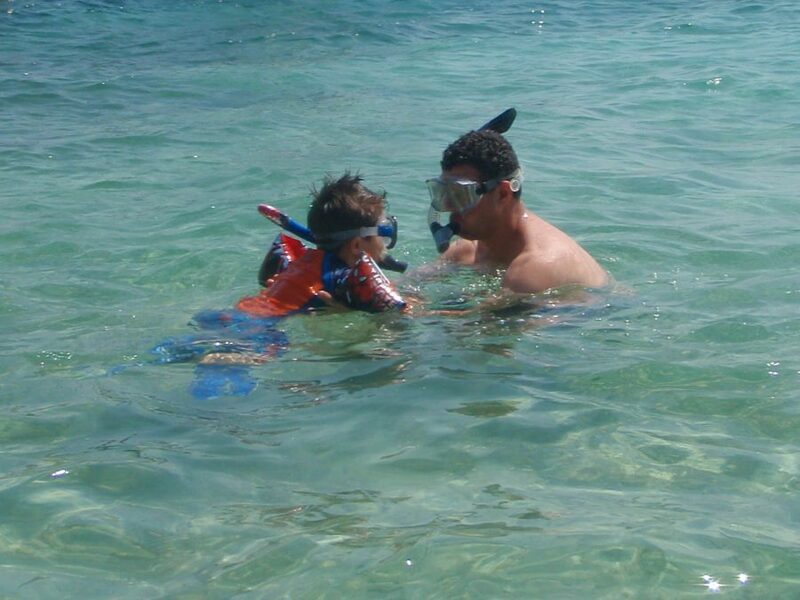 This is a really nice write-up showing how parents can travel with small children. I’m going to share it with my friend, who was a big traveler before he had kids, but now feels he can’t travel at all. Thanks!! Pirate Island is one thing i had to skip on my Colombia trip, due to heavy rainfalls and storm. Looks really nice place to spend a day! I went to San Andres Island, also beautiful but much bigger. What stunning photos! I can see why you traveled there. Looks like an amazing day in paradise and right up my alley! Good tips too on what to look out on, especially the Lobster info! I love anything to do with pirates. As a kid, I used to go on the Pirates of Caribbean ride about 10 times in one day at Disneyland. Seems like a good family trip! Your pictures are really gorgeous and bring out the essence of this destination. I had to laugh a little when you said you skipped the aquarium and decided to rest on the beach like pirates. Fun day. Pirate Island looks so awesome. I hope to visit one day. If I do, I will also skip the dolphin show and relax instead. Well I read this at the perfect time – in the midst of planning a trip to Cartagena. We are going at the end of September, so I am unsure if we will get much beach time because it is rainy season. Would you recommend this trip for people without kids, or was it majority a family destination? Beautiful post…it really does look like an island for pirates..ha ha…the scenery is lovely and looks like you had a lot of fun, South America is on my bucket list! Thanks for sharing! When I think of Colombia I don’t often think of beaches so this is something I would most definitely be interested in adding on when I visit Cartagena. I love your inclusion of the kids! I don’t have kids, but hope to someday be able to take a little one on adventures around the world with me! It looks like a serious paradise! Good tip about not bothering with the hotel bookings, I always prefer to negotiate at the time! Would love to travel to this part of the world. This is a great post. No wonder the children were excited to visit Pirate Island!! I like the sound of the private bird sanctuary too and I am desperate to visit Colombia one day so I will pin the post for future reference. I totally agree with you about dolphin shows btw. The islands look amazing! It’s always nice when you can mix a country rich in culture like Colombia with the beautiful waters, fun, and relaxation of a beach destination! You guys are quite the inspiration because I’m about to get married and I know kids aren’t too far into my future and I am dying to take them all over the world. What a spot too! That water is gorgeous! Great tips and I would’ve probably assumed there would be shade… Great post! Cheers! What a great slice of paradise! I’ve actually never heard of it but looks amazing! I guess where ever you go Lobster is expensive then, definitely a big treat!! The island looks amazing! This isn’t at all what I imagine when I think of Columbia – reminds me of one of the Caribbean islands almost! What an amazing place to take the kids ! I’d love to take my class here on a school trip ! You guys are making such awesome memories with your kids- this is so cool. These are the kinds of memories that will last a last time. Pirate Island looks so fun and relaxing!! Haven’t been to Colombia yet, but will definitely check this out! This sounds like such a lovely day for your kids! If there’s one thing I’ve learned from teaching, it’s that kids love pirates. And the water in your pictures is so sparkling, it makes me want to dive right in! Even though I’m not a child, I think I would really enjoy relaxing on the beach here. Pirate Island does sound enticing! Yet, whenever we try to “stop and unwind” we get restless and can’t sit still. Sometimes it’s a curse feeling like we are missing out on another adventure if we don’t keep moving. Looks like you really know how to travel with toddlers! I would not know how to begin! Fortunately my kids are al grown but oh how I wish I could do it with my grandkids! This looks way prettier than the beach I ended up at when I was in Cartagena a couple of months ago. I’ll have to check out Pirate Island next time. Looks like a fun getaway! Definitely need to get back to the Caribbean. From the water to that tasty lunch it sounds great. Pirate Island! I can’t even imagine how excited the kids would be to visit a Pirate Island. Looked liked they had plenty to keep everyone busy no matter what you wanted to do. I’d join you and just relax and eat all day on the beach! This sounds like it was a really worthwhile day trip! Cartagena is on my list and I think I would definitely visit Pirate Island as well. Great tips on jelly shoes and sun screen – now I know what to pack! Pirate island seems heavenly! And it seems like the kids enjoyed it too. I agree that it was probably a good idea to skip the dolphin shows. The entire trip to Pirate Island sounds great! The island looks beautiful and your lunch sounds delicious . Great tips about settling on a price for the lobster before they cook it and to bring water shoes. 1,300 species of plants and animals? Count me in. It truly sounds like a natural paradise, not just a Natural National Park. The beaches look lovely. Too bad there was no treasure to be found 😉 but it looks beautiful and I agree with giving th dolphin show a miss for more time on the gorgeous beach! Pirate Island…what a great spot. Fun for kids and adults alike 🙂 The waters are so clear and inviting. Would love to indulge in that lobster lunch. What a great way to spend the day. Haven’t made it to Columbia yet, but hoping to in the near future. It looks like a perfect day trip! A swim in the Caribbean sea sounds perfect and its great to hear that you were not pestered by people trying to sell their items. Putting this on my list! this looks like so much fun! i love seeing other toddlers out traveling to some of the less common “family travel” places! it inspires me to get my kids out there too! The lovely blue waters look so inviting. I am sure you all had a great time on Pirate Island. BTW, did the kids find any hidden treasures? Looks like a great way to spend the day! Seems like the bartering for the lobster happens on alot of islands. Pirate island looks lovely! And sounds nice too, especially if fresh lobster is offered as a lunch upgrade. Wow! Pirate Island – I’m surprised with a name like that I hadn’t heard of it before. 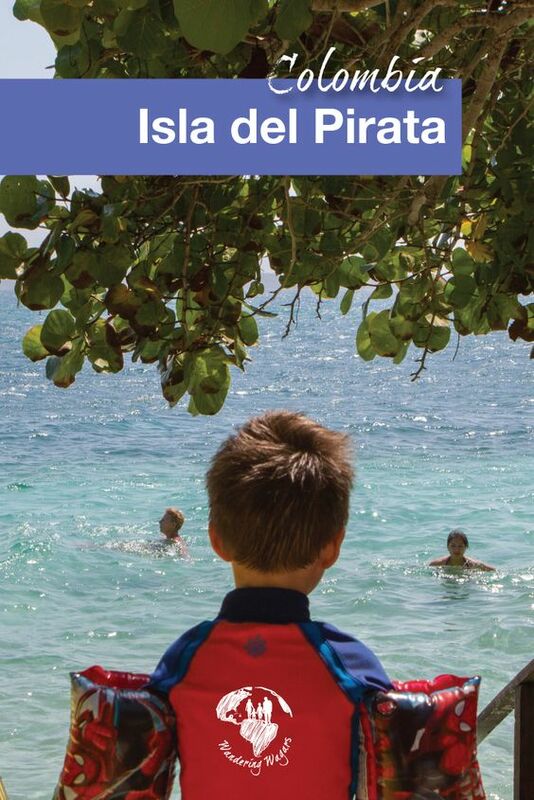 I am mean – who would NOT want to go the Pirate Island – I would be more excited that the kids! And all those species of plans and animal – how incredible! 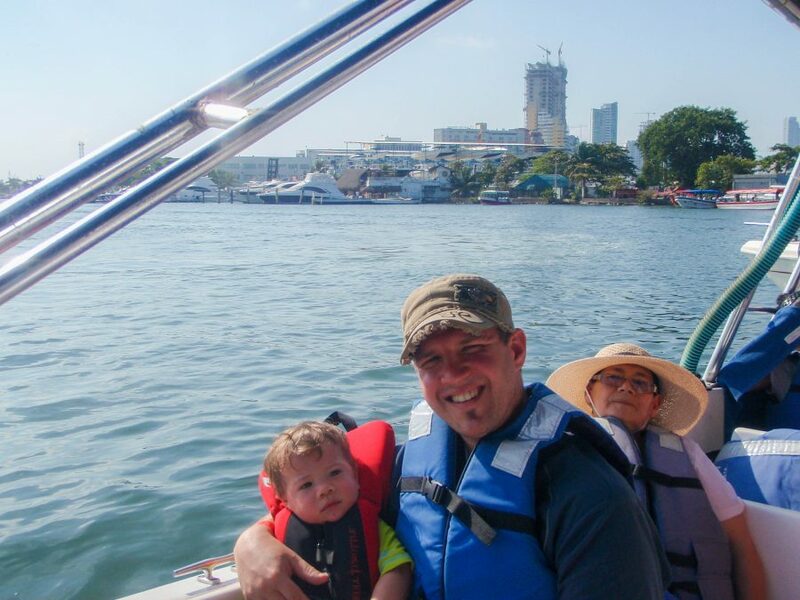 Looks like tons of fun for the kids, but I’m most grateful for the tips you’ve included – about drinking water, sunscreen, the slippery rocks… I’m also super jealous of the fresh-caught shrimp you got to eat. That had to be incredible!! Wow – what an incredible adventure and learning experience for your kids. I was just in Colombia in January and found it a charming and beautiful country (outside of Bogota). Travel changes lives. You are able to snorkel right off the island Caroline. However, there are better spots that are a short boat ride away. The beach is like a paradise. Base on the pictures you’ve shared that your kids had a great time there. What a happy and adventurous family! i like that there are tips on it. its really detailed. 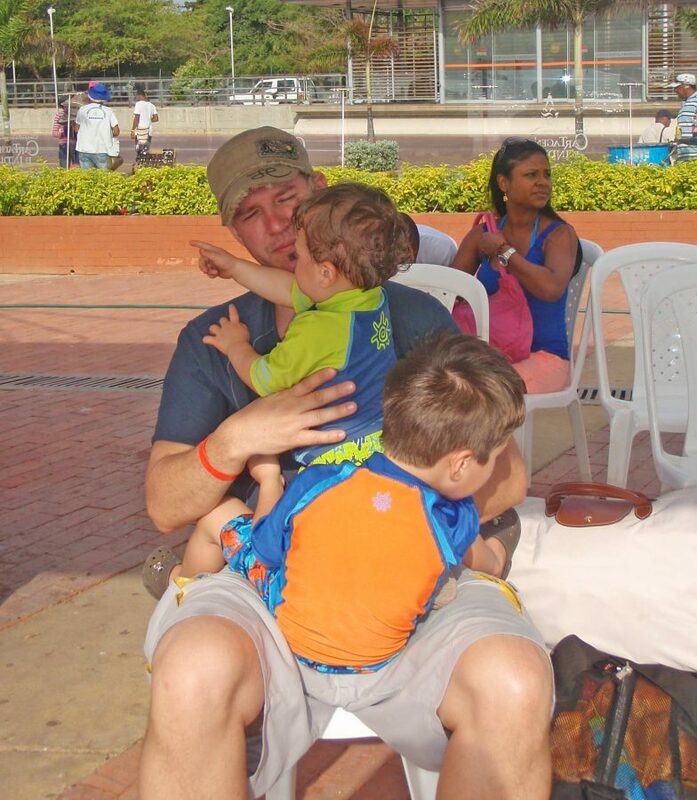 i always remember having guests with 3 kids which i guided for 20 days, and the kids were 17 months old, 3 years old and 5 years old.. it was challenging but really amazing.. i loved it actually. That’s awesome Ferna! Traveling with kids can be challenging, but the rewards sure make up for it! It’s nice to read posts about South America. Philippines also has a lot of stunning islands and beaches so I can totally relate with your Pirate Island experience in Colombia. Thats great to hear Jon! I’m so happy to hear of others who aren’t afraid to bring their children out to meet the world!